After driving the IGT for a few weeks I wanted to make some enhancements to the car. Cen Matrix C-1 Sway Bar Set. Imagine the possibilities with a 6s lipo........ maybe in the upper 80's? 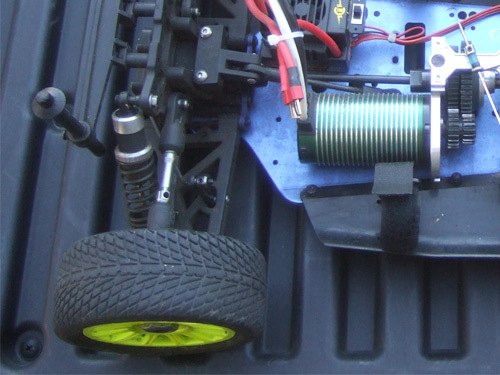 Right now with a 4s lipo the motor turns at 36,960 RPM, that is similar to most nitro engines. By adding 2 more cells, that would bump the RPM to 55,440. Here is a view from the top of the new mods I added. 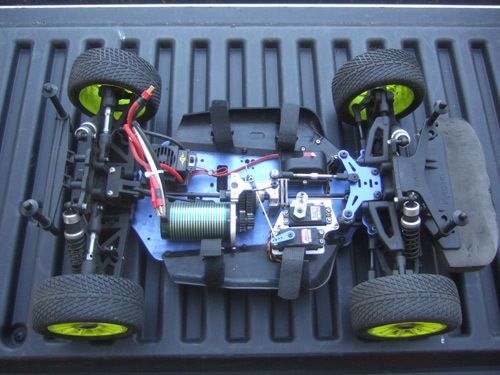 I wanted the receiver in a box to make the car look cleaner by reducing the amount of lose wires hang around. Since I had a Traxxas Emaxx RX box already, I had to figure out how to make it fit. 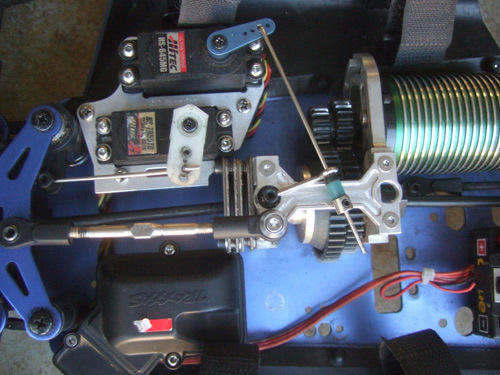 The best place to put the RX is in the front, away from all the other electronics and in order to do that I had to cut the servo mounting plate where the RX use to sit. Because I moved the RX from where it was, that solved another problem I had; the lack of a front chassis brace. For some odd reason the IGT never came with a front chassis brace, so the front end of the car always had a lot of flex. While digging through 1/8 scale parts I found a Losi turnbuckle that fit perfectly. Tthe picture below shows all the changes I have made. In the initial brushless conversion I converted the single disc brake to dual disc brakes; however I used one of the disc brakes from my other IGT. So when I trade my other IGT on RCU, I had to take the one of the disc brake off. I ran the single rotor setup for a little while but there was a lot of brake fading after a few hard stops. I went on to ebay and found a parts lot for a MP777 car. So I used the MP777 brake rotors and springs from that auction. Then I used the brake pads from my Cen Matrix C-1 because it seems to have better stopping power. And now the IGT stops on a dime, it actually stops too well now. I think I need to adjust the brakes a little so it does not feel like I am slamming the brakes every time I use it. Since I had a lot of 1/8 parts, I thought I would be interesting to see what will fit on the IGT too. One of the problems with the IGT is being about to adjust the suspension. I would have to take the arms off so I can make a small adjustment. Basically I needed some adjustable turnbuckle, and not just a threaded rod. The only thing that I was able to swap out is the upper rear arm, so now can adjust the rear camber with ease. I also had a extra set of sway bars from my Cen Matrix C-1 and to my surprise, It fit perfectly on the IGT.